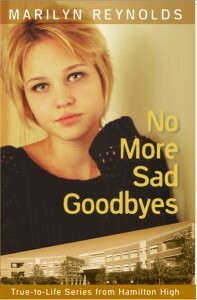 Teaching guide available for No More Sad Goodbyes! I can’t go through with it. “Come on, here’s to 18,” he says, clinking his bottle against mine and taking a sip. Under the stars, feeling the glow of champagne, when Jason leans over and kisses me, it seems right. And when we do exactly what he’s wanted to do, that seems right at the time too. Autumn still misses her mother, who died when she was five. But her father and grandmother are raising her with love, laughter, and common sense. She’s a top volleyball player and student. Then it all falls apart. A family tragedy strikes just as Autumn learns she is pregnant. Difficult choices confront her and she will have to find new support, quickly. Order directly from New Wind, from Amazon, or your local independent bookstore. Booksellers: this title is available through Ingram Distribution.